I was very glad to see a Baptist Seminary, known for its fundamental and conservative position, publish a straightforward, scholarly position on this divisive issue. 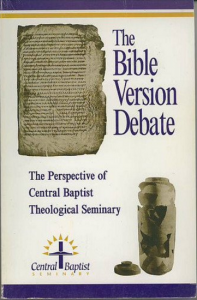 The Bible Version Debate is written and published by Central Baptist Theological Seminary in Minneapolis, MN. The chapters were written by President Douglas McLachlan and three professors. I especially enjoyed reading the book because Central is my Alma Mater and these professors were classmates of mine. The book begins with a quote from the late founder and president of the seminary, Richard Clearwaters, from his book The Great Conservative Baptist Compromise, “Honesty compels us to cite the 1901 American Revised as the best English Version of the original languages which places us in a position 290 years ahead of those who are still weighing the King James of 1611 for demerits.” Also, “We know of no Fundamentalists . . . that claim the King James as the best English translation. Those in the main stream of Fundamentalism all claim the ASV 1901 as the best English translation.” That sounds amazingly like my old college professor, Noel Smith who used the ASV 1901 in class at Baptist Bible College. I personally agree with the conclusions of this book. I have never been a majority Text or Textus Receptus fan. Although I grew up hearing Pete Ruckman speak at my church, I was not taught a KJV Only position at church, at Baptist Bible College (68-72), at Central Seminary (72-75) or at the GARBC seminary I attended (82-84). As Dr. Clearwaters’ quote points out, the KJV Only position is a recent intruder into Fundamentalism. There are a few valuable contributions that this book from Central Seminary makes to the overall discussion. 1) Roy Beacham, professor of Old Testament, points out the inconsistencies of the Old Testament texts, specifically the Masoretic Text. It is wrong merely to assume that all Old Testament texts agree. 2) W. Edward Glenny, professor of New Testament, shows the unreliability of the Textus Receptus, especially when arguing for divine preservation. 3) Glenny has an excellent chapter on Biblical preservation and the misuse of “preservation texts” by KJV Only advocates. The seminary’s position on Bible translations is set forth in three criteria for what can be called the Word of God. “They must be (1) translations, (2) nonsectarian and (3) made from the original language manuscripts. We can be confident that any nonsectarian translation of manuscripts of the original languages is the Word of God” (p. 119). This book is a welcomed step for Baptists to return to their roots as Bible believing people.